For any cook – low sodium or not – constant inspiration is essential to keeping your food fresh and fun. And there are two places, in particular, where I know I can always find my cooking muse: the farmer’s market and TV cooking shows. A few nights ago, while trying to distract myself from the third day of a liquid-only diet, I watched one of the best Iron Chef America shows I had seen in a while. Battle Grape. 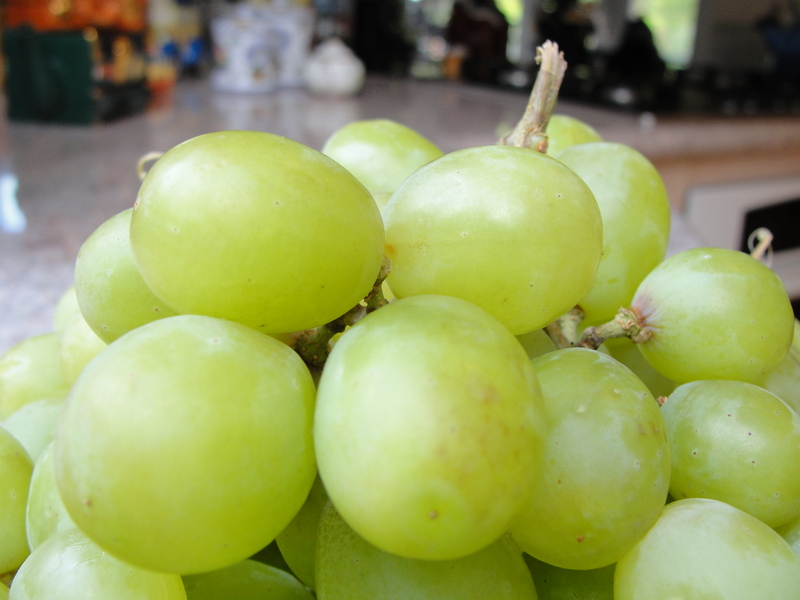 Now, I had already been introduced to the surprisingly, sweet compliment that grapes can add to savory dishes. Boy had made a creamy, green grape and butter sauce for halibut once before and I had attempted a make a green grape gremolata for sardines as well. But after watching Chef Cat Cora and Chef Holly Smith battle it out on national TV, I realized that I had hardly tapped into the power of this simple, snack food. In case you want to experience the battle word for word – literally – here is an actual transcript, with commercials included. But if you are in the mood for more of a quick read, I’ll give you the highlights. My four favorite grape adaptations were: (1) fennel, pickled grape, and yellowtail hamachi salad; (2) roasted grape risotto; (3) chard leaves stuffed with sauteed grapes; and (4) white grape gazpacho. Each plate looked gorgeous and delicious. I know these are four recipes that I will, someday, attempt on my own and grape preparations that will find their way into simpler applications as well. But to leave you with some food for thought, here is a low sodium recipe for white grape gazpacho. Since I have yet to make it myself, I’m thinking some of you readers may get to it before I do. And if you do, send pictures my way (sodiumgirl@gmail.com) and you might just see your low sodium creation on the pages of this site. 1. Place grapes, cucumber, scallions, pine nuts, and toasted bread into the food processor and pulse about 10 times. 2. Add the half & half, crème fraiche, vinegar, olive oil, and ½ cup of the dill and blend for 1 minute until smooth. 3. Season with white pepper. Chill thoroughly. 4. Serve in chilled bowls, garnished with the remaining chopped dill and grape halves.